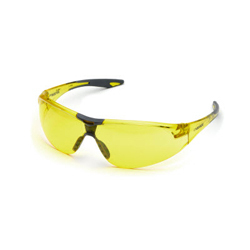 Editors Note: This article was originally published in The Shooting Wire on December 5, 2012. It is being republished here with permission from Editor Paul Erhardt. The Athena Gun Club is the range your range hopes to be when it grows up. 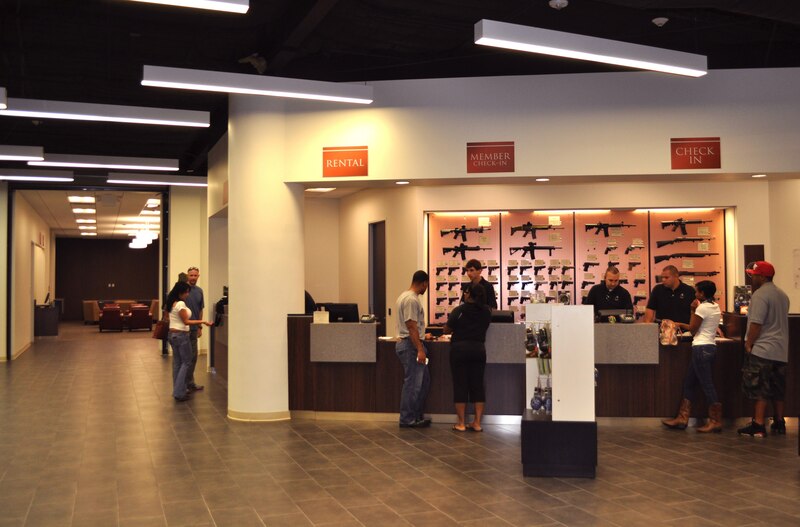 Located in Houston, Texas, with something like 100,000 oil industry execs within a few minutes drive, the Athena Gun Club is 39,000+ square feet of ranges, retails space, classrooms, and amenities that sets it far apart from other ranges you’ve visited. 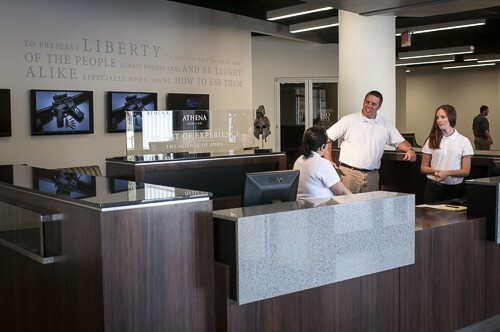 The design and layout of Athena is the brainchild of CEO John Boyert, and his wife (and CFO) Susan Cho, who worked with Houston-based firm Acumen Design to create an overall space and flow – along with a non-traditional firearms shopping experience – that gives the club its very upscale feel. Upon entering the club the first thing you notice is the front desk, which is more akin to one you’d find in a hotel lobby than at any gun club you’ve seen. 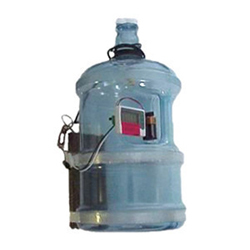 It’s located in a huge, open foyer that’s brightly lit, inviting, quiet and immaculate. It’s at that front desk where you are immediately greeted by one of the club’s 49 uniformed employees who project both professionalism and warm hospitality – again, more akin to that of a hotel than a range – and leave you with the feeling that this is the place you want to come and shoot. And that first impression, the importance of it on you as a potential member, is something Boyert borrowed from Conrad Hilton’s book. Hilton, of the Hilton Hotels empire, knew a thing or two about the value of first impressions, and considering that the Athena Gun Club sits next door to one of the richest zip codes in the country, Boyert understands how valuable that first impression is to the success of his business. 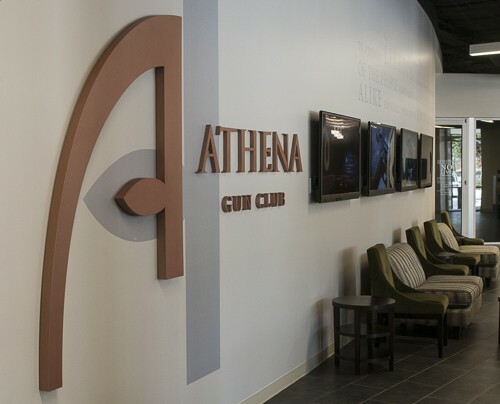 To put it simply, everything about the Athena Gun Club is geared towards creating a high-end experience for the visitor – regardless if you are a multi-millionaire executive in the oil industry or the clerk from the mailroom. Great attention to detail has gone into giving each and every visitor a world-class experience. And why not? They want you to come back. Boyert has pored over all the available data from the National Shooting Sports Foundation that they’ve compiled to help firearms retailers and ranges. With that data in hand, and Conrad Hilton’s expert observations, Boyert has envisioned the club to be the place you don’t visit just once a month to shoot, but every week. He explained that the Athena Gun Club is going after “a demographic that other ranges aren’t even targeting” and probably never considered. 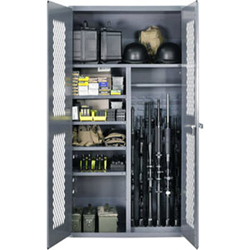 For instance, because of the oil industry and corporate rules they have established about firearms on their property, Athena Gun Club will store firearms for its Executive and VIP members. These are individuals who pay a hefty membership fee and a regular monthly fee which provides them access to seven private VIP shooting lanes, on-site firearms storage, a cigar room with fully stocked humidor, private entrance and gun valet services, on top of other amenities and Athena’s always attentive staff. A tour through the VIP area was like walking through the clubhouse or members locker room at a private country club. In addition to luring in Houston’s business executives, Boyert is also targeting the corporations themselves by providing them a unique off-site meeting place where a sales team can easily have their meeting thanks to standard business tools like WiFi, AV systems, a conference room, and catering (of course). Though a brand new business that just had it’s grand opening this past weekend, the Athena Gun Club has reached out to build relationships with other local businesses. Not only has Boyert sought out the advise of local restauranteurs – again stealing from the hospitality industry – but he has also lined them up to help cater Athena’s special events and the range’s soon-to-be-opened cafe. No, you’ll have to make do with food from the likes of Jimmy John’s Gourmet Sandwiches and Carrabba’s Italian Grill, as well as other local venues Boyert is reaching out to in order to better service the Athena Gun Club members. Building partnerships is a key element of the business philosophy employed by Boyert and Cho to help them deliver on the Athena promise. 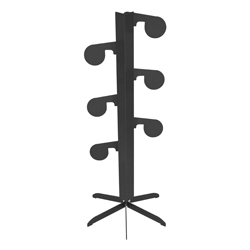 One of those relationships, and perhaps the most important one after that with Acumen Design, is with Action Target. You can’t have a gun club without a range and Boyert literally met with every major shooting range company before settling on Action Target and putting his faith in them to deliver the best shooting experience possible. And that faith paid off big time as contractor issues put the gun club build-out behind schedule, forcing Boyert to turn a 12-week range install into a 4-week rush job for Action Target. For those familiar with the Utah-based Action Target, a company with one of if not the best reputations in the industry, it will hardly come as a surprise that not only did the Action Target team get the new state-of-the-art ranges – 26 lanes in all – installed in the 4-week window, but they did it without additional staff or going over budget. 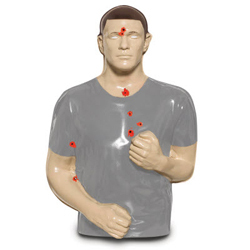 Boyert’s appreciation for Action Target is apparent in the way he speaks about their work as one of their customers, and it reflects the way he sees Athena Gun Club’s members speaking of the club. 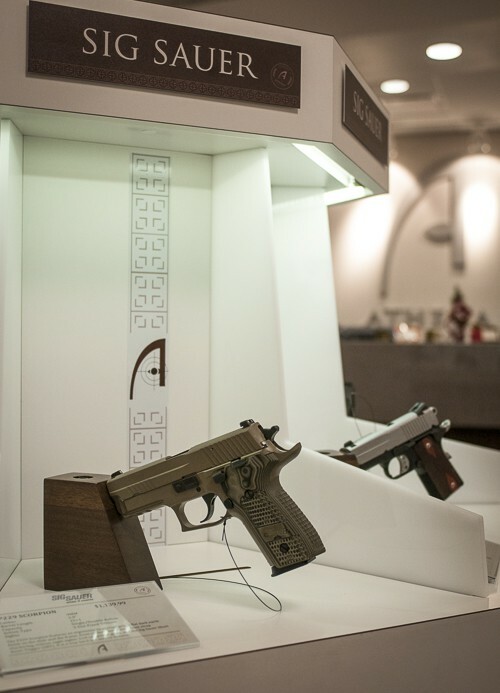 In picking other industry partners whose work and reputation reflects the appropriate image for the club, Boyert chose carefully when selecting the brands he’d carry in Athena Gun Club’s store. When you decide to back everything you sell to your customers with a lifetime warranty you had better pick the right brands. 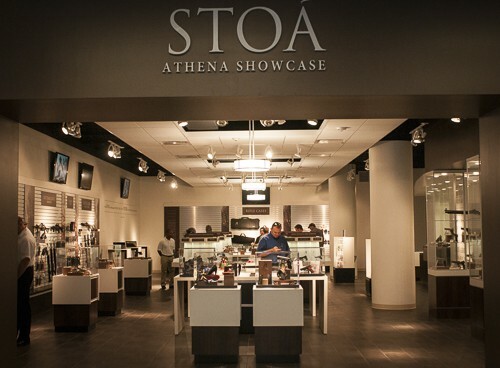 In a retail space laid out more like an Apple Store with gun kiosks reminiscent of SHOT Show displays (instead of those dreary standard glass gun cases), you’ll find Glock, Smith & Wesson, HK, Sig Sauer, Wilson Combat, Kimber, SureFire, Magpul, Galco and others. And all of it at prices competitive in an area serviced by numerous firearms retails, including no less than 20 Academy locations. It’s difficult to fully capture the essence of the Athena Gun Club experience but it’s one that is totally different than what most shooters have come to expect from their local indoor range. It is refreshing and hopefully inspires other range owners to up their game. Of course, the obvious question is can an upscale shooting club of this nature survive as a going business concern. I asked Boyert directly how long he thought it would take to reach profitability considering the tremendous investment made in the facility by him and his shareholders. While I fully expected a three, four, or even five year response, I was delighted to hear not only does he see it taking one year, but that expansion to new locations is part of the vision for the future of the Athena Gun Club. With something like 4,000 people visiting the facility during its grand opening, it looks like the Athena Gun Club is well on its way. And I won’t be surprised if more than a few industry execs find their way to the new club next year when they gather in Houston for the annual NRA Show. ….Hmmm, what an interesting place to hold a new product introduction and media event during the NRA Show. Beautiful investment, the kind that really shows what true “gun clubs” should aspire to be. Yes, massive investment, but this is not a one off deal. High time some of the anti-gunners took a look at what “sane” and mentally sound gun owners, really do in their spare time, even with the idiotically termed “assault” rifle.